The nutrients you'll gain from a cup of egg whites depends on how they're used. If you bake a cake, then each slice contains a fraction of the total nutrients. If you plan to make an omelet, however, it is possible to consume an entire cup of egg whites. They're low enough in calories that you'll gain lots of protein without ruining your diet. Just be aware that one cup of egg whites is high in sodium. Egg whites contain about one-fourth of the whole egg's calories and a little more than half of its total protein. It takes seven to eight large eggs to produce 1 cup of egg whites, for a total of 126 calories and 27 grams of protein. If you ate a cup of egg whites, you would get about half of your daily protein, based on the daily value of 50 grams established by the U.S. Food and Drug Administration. All of the egg's fat is in the yolk, so the whites are fat free. You'll get a small amount of carbohydrates in the form of natural sugars. Eggs naturally contain sodium, so when you use enough to fill one cup, the sodium accumulates to a significant amount. The University of Kentucky notes that two egg whites equal one whole egg, so 1 cup of whites makes the equivalent of a large, four-egg omelet. If you ate the whole omelet, you would consume the entire 403 milligrams of sodium in 1 cup of egg whites. The Institute of Medicine recommends limiting your daily sodium intake to 1,500 milligrams. One cup of egg whites has 49 micrograms of selenium, which is 70 percent of the U.S. Food and Drug Administration's recommended daily value of 70 micrograms. Your body depends on selenium to produce an antioxidant called glutathione peroxidase, which works with vitamin E to protect cells from damage caused by free radicals, according to New York University's Langone Medical Center. You also need selenium to produce thyroid hormones that regulate metabolism and to keep your immune system working at optimal capacity. Vitamin B-12 comes from animal products, including eggs. Egg whites do retain some of the whole egg's B-12, with 1 cup of whites supplying 0.22 micrograms, or 4 percent of the daily value of 6 micrograms. One cup of egg whites also provides 5 percent of the daily value established by the U.S. Food and Drug Administration for vitamin B-5, or pantothenic acid, and 63 percent of the daily value for riboflavin. All of these B vitamins support your metabolism. Vitamins B-12 and B-5 also help produce healthy red blood cells. 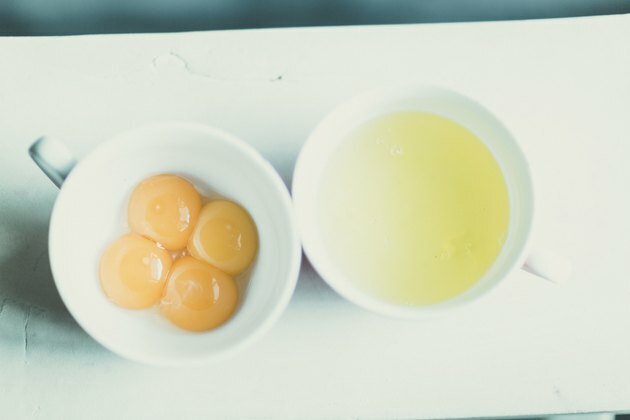 Eating egg whites has the benefit of eliminating all of the egg's fat and cholesterol, but you also lose several important nutrients found primarily in the yolk: iron, zinc and vitamin A. Egg whites provide barely a trace of iron and zinc. They don't contain any vitamin A, which means you will miss getting a significant amount of two antioxidants that help keep your eyes healthy, lutein and zeaxanthin.